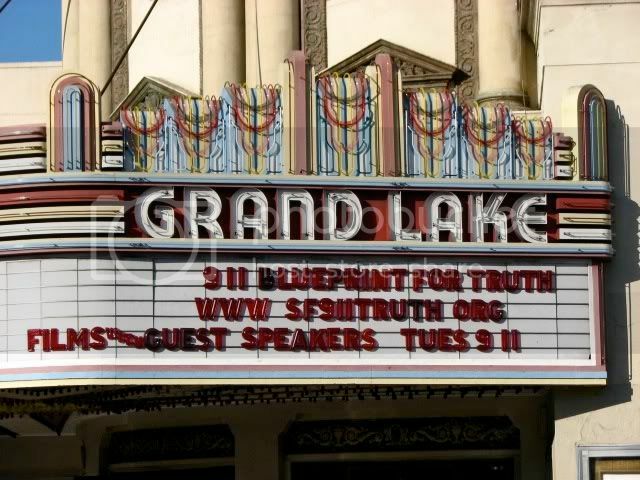 Grand Lake Theatre 9/11 Truth Film Festival A Huge Success! Our two-day 9/11 Film Festival and Speakers Event at the historic Grand Lake Theatre in Oakland, California, began early Monday afternoon, September 10th, and culminated Tuesday evening, September 11th, with a standing room only crowd in the main auditorium which seats 630 people, and was a wild success by any standard. Jeanette McKinley, an artist living across the street from ground zero on September 11th, who provided dust samples to Dr. Steven Jones and architect Richard Gage, gave two presentations. There were two sneak previews of a new independent film, The Reflecting Pool, with in-person presentations both days by the three Los Angeles producers, stars and cinematographer: Jarek Kupsc, Joseph Culp and Jodie Baltazar. The Reflecting Pool is a dramatic film, not a documentary, and does a superb job of dramatizing a very complex and difficult subject. The Reflecting Pool will premiere on November 3rd at the Fort Lauderdale Film Festival. Visit www.reflectingpoolfilm.com. CAIRO, Egypt - Terror mastermind Osama bin Laden plans a new video addressing the American people regarding the anniversary of the Sept. 11 attacks, terror monitoring groups said Thursday. SITE Intelligence Group said an Internet announcement of the plan included a photo of the al-Qaida leader from the upcoming video — his beard, which in previous messages had been streaked with gray, was entirely dark. Intelcenter, which is based in Alexandria, Va., and also monitors Islamic Web sites, said the video was expected within the next 72 hours, or by Sunday. That would come before the sixth anniversary next Tuesday of the World Trade Center attack. The last bin Laden video was in October 2004, shortly before the U.S. presidential elections. Rita Katz, director of the Washington-based SITE Institute, said bin Laden's beard appeared to have been dyed, which she said is a popular practice in the Middle East. Interview with Bay Area architect Richard Gage, AIA, about the organization he has formed, "Architects and Engineers for 9/11 Truth". Outreach to architects and engineers; presentations to the public and to professionals; the physical evidence of controlled demolition of the World Trade Center twin towers and building seven. Richard Gage, AIA, will give the keynote address on September 11, 2007 at 7:00pm at the Grand Lake Theatre in Oakland. Visit his website at www.ae911truth.org. Cindy Sheehan To Appear With 9/11 Hero William Rodriguez This Friday! 9/11 HERO AND SURVIVOR WILLIAM RODRIGUEZ LIVE IN LOS ANGELES! Special guest appearance by actor ED ASNER! CINDY SHEEHAN, who is calling for a new investigation into the events of 9/11. Both Ed and Cindy invite you to join them in paying tribute to an American hero. Author Webster G. Tarpley in a three-hour presentation with slides at the June 22, 2007 Vancouver 9/11 Truth Conference. We will focus today on the day of September 11, 2001, and the twenty-five military exercises, or drills, taking place just before, on, and after that fateful day. Fundraiser for KPFA Radio with Bonnie Faulkner. Over five years on the air and still going strong despite being a purely volunteer effort, Guns and Butter is the only show on KPFA that has consistently provided in-depth coverage of alternative 9/11 analysis. Please show your support by caling in a pledge at 800-439-5732 during air-time today, from 1-2pm. If you don't want to or can't afford to pledge, you can still support us by calling the listener comments line at 510-848-6767 x 622 and saying something nice about the show.